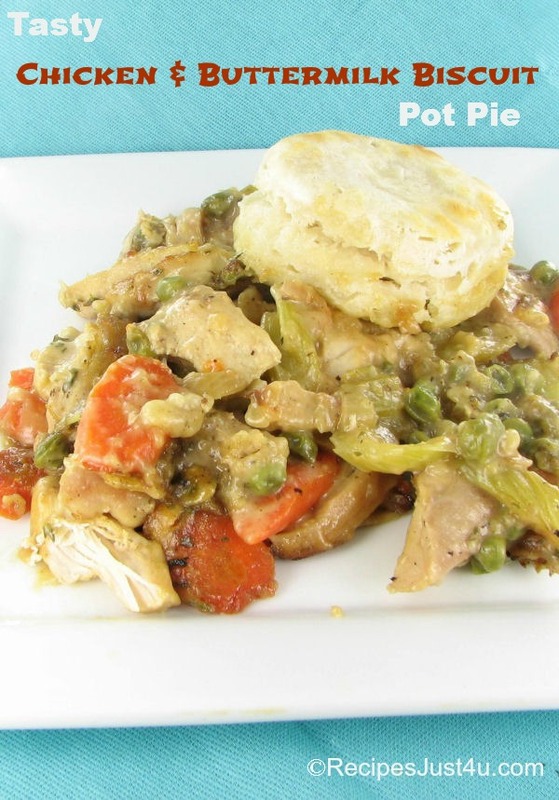 This recipe for chicken and biscuit pot pie uses buttermilk biscuits instead of a crust on the top and bottom to reduce the calories slightly. But the recipe loses none of the taste. It is delicious. 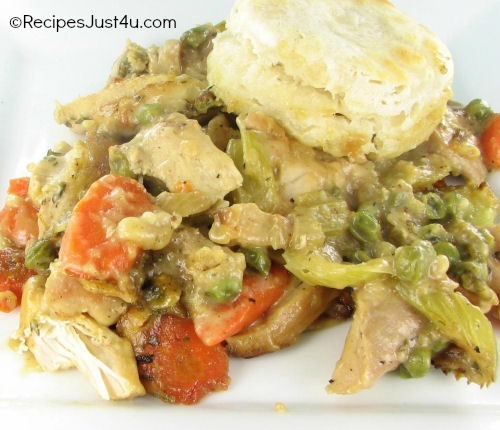 Chicken pot pies reminds me of my childhood and those days of eating fall comfort food. My mother used to make this recipe often. This recipe is also a staple here in the South where home cooking is so popular. Biscuits seem to be served with everything! To make the biscuits, combine all the dry ingredients and mix well. Then cut in the butter with with a pastry cutter, or by putting the ingredients in a food processor and pulsing for a while. Once the dry ingredients are well combined, add the buttermilk and make a ball. Place on a floured board. 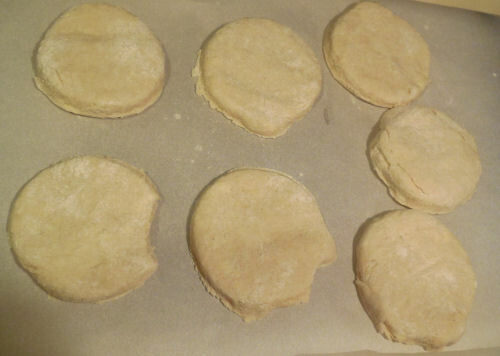 Gently pat until the dough is about 1/2 inch thick (don’t use a rolling pin or you will make the biscuit later tough) and use a biscuit cutter to form rounds. Place the rounds on parchment paper and then place them in the fridge to chill. Now it’s time to make the filling for the chicken. 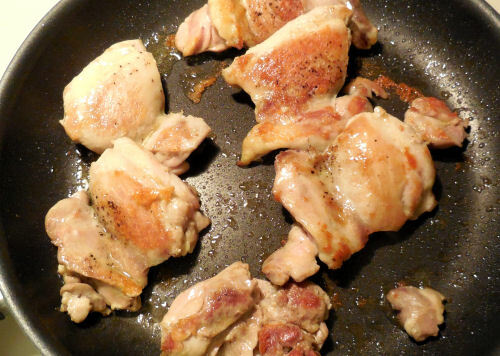 First season the chicken and then brown it in a bit of olive oil in a saucepan on the stove top. Cut into chunks and set aside while you cook the vegetables for the casserole. 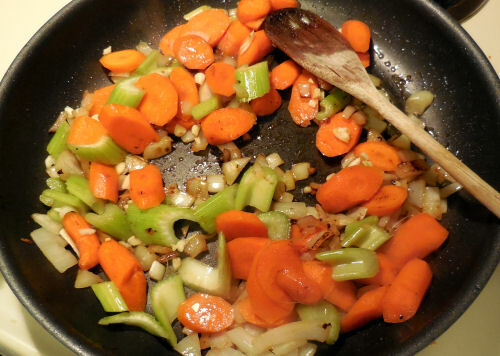 In the same pan, cook the onion, garlic, carrots and celery until tender. This will take about 5-7 minutes. Add the cooked chicken into the vegetable mixture. Remove and keep warm. Stir in the milk, chicken stock and sherry, with the thyme and nutmeg. 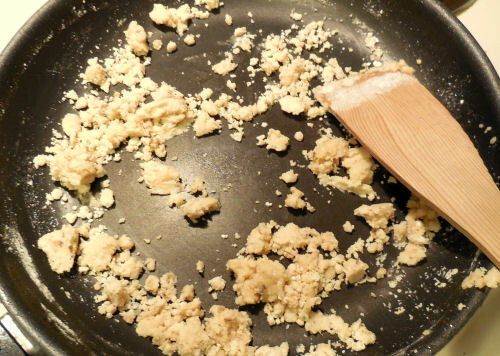 Cook until the mixture starts to thicken. Season with salt and pepper to taste. 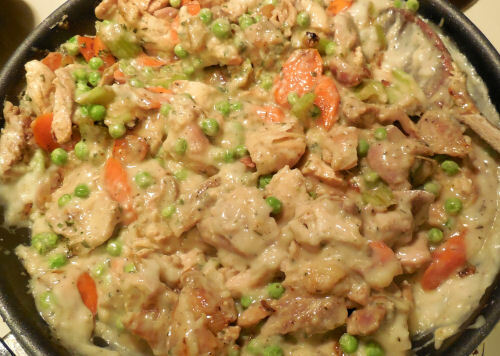 Return the vegetables and chicken mixture to the sauce in the pan and stir well to coat. Add in the peas and fresh parsley and mix well. Fresh parsley adds a lovely flavor that is so much nicer than dried parsley. I like to use fresh herbs for cooking when I can to add extra depth to the taste of the dish. Now it’s time to add the chilled biscuits and cook another 10 – 12 minutes until the biscuits are lightly browned. It makes a great looking dish. Each serving has its own biscuit right in place! Serve immediately. The chicken and biscuit pie is lovely served with a tossed side salad. Each bite of the dish delivers a creamy sauce that is lightly seasoned and a helping of fresh cooked vegetables. The biscuit is great for mopping up some of the extra sauce! 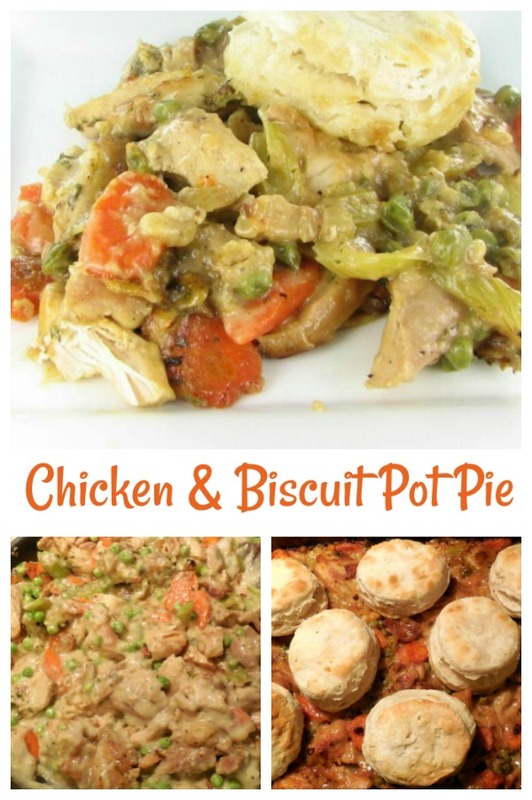 To remind yourself of this recipe for chicken and biscuit pot pie, just pin this image to one of your Pinterest food boards to find it easily later. Love chicken and biscuits? Try this recipe – It uses a shortbread muffin topping. 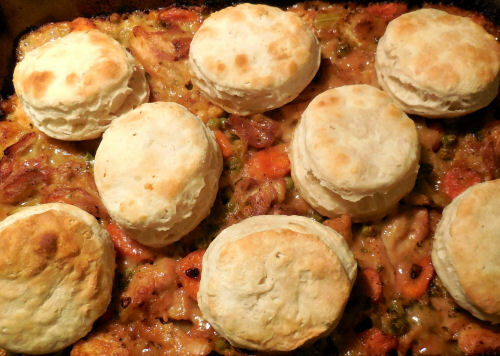 This recipe for chicken and biscuit pot pie uses buttermilk biscuits instead of a crust on the top and bottom to reduce the calories slightly. To make the biscuits:Combine the dry ingredients in a bowl or food processor. With a pastry cutter or your fingers, cut the butter into the dry ingredients until the butter resembles course meal with some larger butter lumps remaining. Add the buttermilk and mix until just combined. If the dough is too dry, add a little extra buttermilk - 1 tablespoon at a time up to 2 tablespoons. Transfer the dough to a floured work surface and pat the dough out to 1/2-3/4" thickness (don't use a rolling pin) and cut out the rounds with a 3-inch biscuit cutter. Transfer the biscuits to a parchment-lined baking sheet and chill until you're ready to use them. To make the filling: Preheat the oven to 400° F. Heat a large pot over medium-high heat and add the oil. Sauté the onions, carrots, and celery until tender, about 5-7 minutes. Season with salt and pepper to taste. 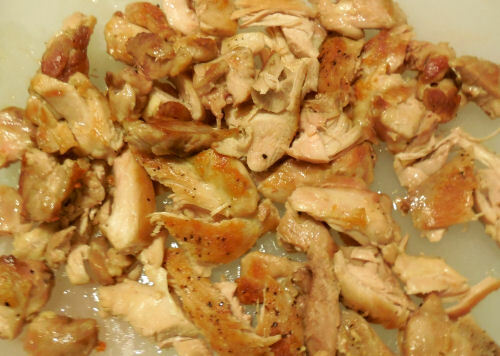 Transfer cooked vegetables to a bowl with the chicken; and set aside. Reduce the heat to medium and add the butter to the same pot. 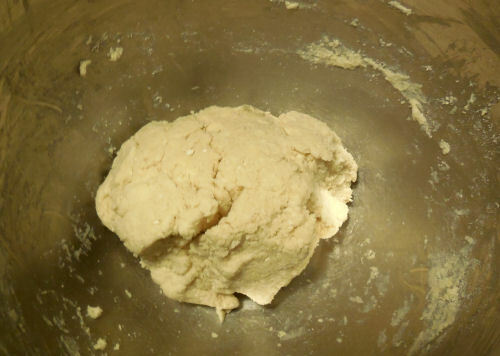 When melted, stir in the flour and cook, making a roue - stirring constantly for 1 minute. Whisk in the milk, chicken broth, and thyme. 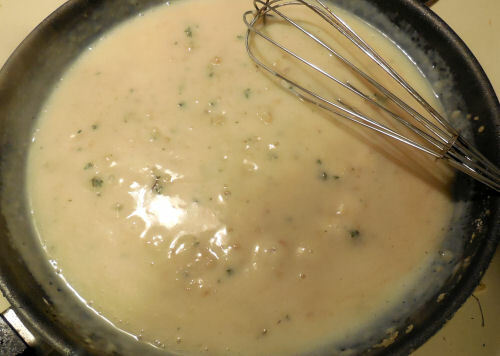 Allow the sauce to come to a simmer for 1 minute to thicken. Season with salt and pepper and stir in the sherry (if using). 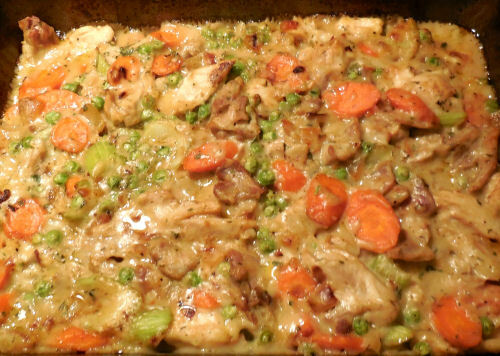 Turn off the heat and transfer the vegetables and chicken to the pot, mix well until the filling is well-combined. Stir in the peas and parsley. If the filling is too thick, add in extra chicken broth, about 1/4 cup at a time until the filling is a good consistency. Pour the filling into a 13x9-inch baking dish and bake for 18 minutes. Remove the dish from the oven, but keep the oven on and door closed,l and top the filling with the biscuits. Return the baking dish to the oven and bake for an additional 10-12 minutes, until the biscuits are golden brown and the filling is bubbly. Cool for 5 minutes before serving. Serve with a side salad for a delicious and hearty meal.